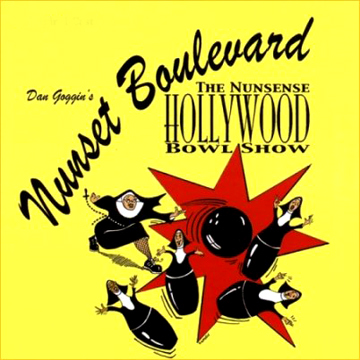 Fans who just can’t kick the “Nunsense” habit are in for another go-round when the Little Sisters of Hoboken return to Reagle Music Theatre in “Nunset Boulevard: The Hollywood Bowl Musical.” With performances set for Saturday and Sunday, June 18 and 19, the Boston area premiere of the show features the original New York cast. In this, the seventh outing written and directed by creator Dan Goggin, the quintet of irrepressible singing and dancing nuns find themselves performing in a cabaret lounge at the Hollywood Bowl-a-Rama instead of at the famed outdoor amphitheater they thought had booked them for a concert. Called “heavenly, hilarious, wacky and unpredictable” by ABC-TV News, and “sinfully funny” by NBC-TV News, “Nunset Boulevard” has the Reverend Mother, Sister Robert Anne, Sister Hubert, Sister Leo, and Sister Amnesia knocking out musical numbers while customers are knocking down pins. In the midst of all the mayhem, the sisters take time out at intermission to audition for a new movie musical about Dolores Hart – an actress who famously became a nun. In the end, “Nunset Boulevard” just proves that the Little Sisters of Hoboken are still big – it's the movies that have gotten small. Reagle Music Theatre is presenting “Nunset Boulevard” as a special bonus visiting production to round out its 2011 summer season. For tickets and information, stop by the box office at the Robinson Theatre, 617 Lexington Street in Waltham or call 781-891-5600.